Ninety-two dated and numbered daily Bible readings to help you understand the Word of God. Ninety-two dated and numbered daily Bible readings to help you understand and apply the Word of God. Contributors: Tim Chester on Revelation, Mark Meynell on Colossians and Philemon, Robin Ham on Galatians, and Albert Mohler, Jr. on Acts. I like the thought provoking questions. So many Bible reading notes just give you the writer's summary and ideas and don't force you to think it through for yourself. Its easy to get lazy with Bible reading particularly when you have been a Christian for many years. Helps me get into a rhythm with my bible readings in the mornings. Unpacking revelation has been good because I wouldn't have read it as closely by myself and the application questions and challenge have really made it relatable. Would definitely recommend this series. 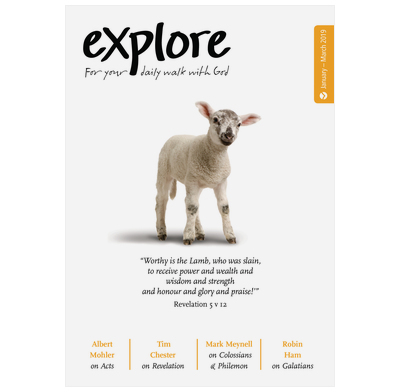 I have used a number of bible study aids in the past but the Explore series is by far the most helpful. I like the posing of relevant questions focussed on specifics in the passage before giving the writer's analysis. The present one on Revelation is particularly exciting and helpful at unravelling the imagery and messages.